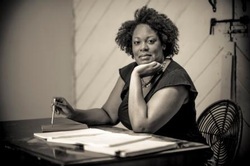 On Friday, April 11th at 8:00pm, playwright, dramaturg, teaching artist and theatre blogger, Jacqueline E. Lawton will lead a post discussion following the production of Insurrection: Holding History co-produced by Georgetown University Theatre and Performance Studies and the Black Theatre Ensemble. The panelist will include director Isaiah Matthew Wooden and the cast. JACQUELINE E. LAWTON was named one of 30 of the nation's leading black playwrights by Arena Stage’s American Voices New Play Institute. Her plays include: Anna K; Blood-bound and Tongue-tied; Deep Belly Beautiful;The Devil’s Sweet Water; The Hampton Years; Ira Aldridge: the African Roscius; Lions of Industry, Mothers of Invention; Love Brothers Serenade (2013 semi-finalist for the Eugene O’Neill Theater Center’s National Playwrights Conference), Mad Breed, Noms de Guerre. and Our Man Beverly Snow. Ms. Lawton received her MFA in Playwriting from the University of Texas at Austin, where she was a James A. Michener Fellow. She is a 2012 TCG Young Leaders of Color award recipient and a National New Play Network (NNPN) Playwright Alumna. A member of Arena Stage's Playwrights' Arena and the Dramatist Guild of America, Ms. Lawton currently resides in D.C.